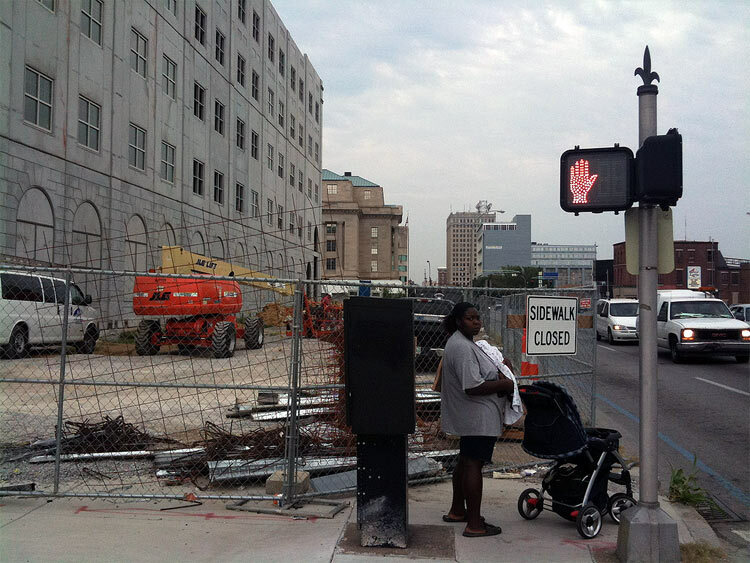 There was a time when Louisville summarily ignored the needs of pedestrians when it came to construction projects around the city. Unfortunately, it appears we’re still stuck in that time today. 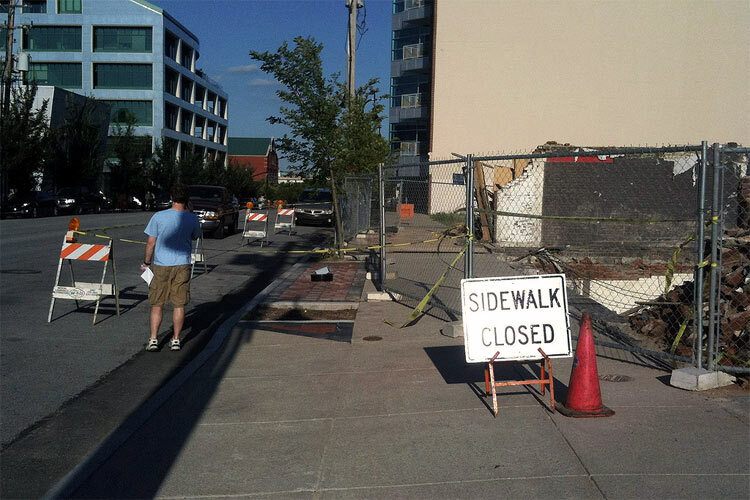 Construction sites continue to pop up around the city that make absolutely no attempt to provide pedestrian accommodations beyond the the singularly unhelpful and downright insulting “Sidewalk Closed” signs. Just a few weeks ago, this wonderful obstruction poped up along East Main Street in order to allow for Todd Blue’s demolition of the St. Elmo’s Building. The closure is in the middle of the block with no warning at either crosswalk. A person with visual impairments would have to walk all the way to the fence before discovering the closure, then backtrack to the intersection, wait for a crossing signal, cross the street, walk down the block, cross again and then walk back to get the condos that are 100 feet away from the fence. The guidelines contained in this Manual shall apply to every development site adjacent to an existing or proposed public or private roadway. The Complete Streets concept applies just as importantly to adjacent construction projects as it does to new road construction. No single set of road users should bear sole inconvenience of the construction. What’s more, most of these construction sites have an abundance of traffic lanes such that creating a temporary sidewalk would have negligible if any effects on car traffic flow. To say that pedestrians can simply cross the street is not an acceptable solution. Why should pedestrians have to go significantly out of their way, even backtracking to make an otherwise simple trip, while car traffic enjoys no such disturbance? At its most basic, this lack of pedestrian accommodation is pure discrimination against the city’s most vulnerable road users. Those who have no other option but to walk are constantly inconvenienced while those who have the physical ability or economic means to drive, speed on by undisturbed. Louisville would never unnecessarily close an entire road without first exhausting all alternatives. Why are pedestrians worthy of less consideration? Even if offering the other side of the street as an alternative route were a legitimate excuse, most pedestrians will not backtrack to the nearest crosswalk and will instead cross the street mid-block or simply walk in the traffic lane, creating extremely dangerous situations. The result? Well, there are some 200 people over the last 10 years who’ve lost their lives because of Louisville’s refusal to take pedestrian needs seriously. And that’s truly sad.